Today’s book review is for The Severed Tower, by J. Barton Mitchell, published by St. Martin’s Press. I received this book directly from the publisher, for free, in exchange for an honest review. I also received an extra copy, which I’ll be giving away in a raffle. Keep reading after the review for details on how to enter to win. 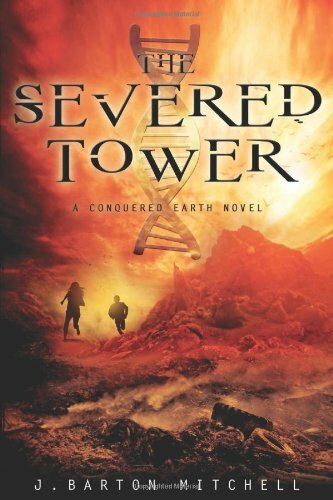 The Severed Tower is the second novel in J. Barton Mitchell’s Conquered Earth series. 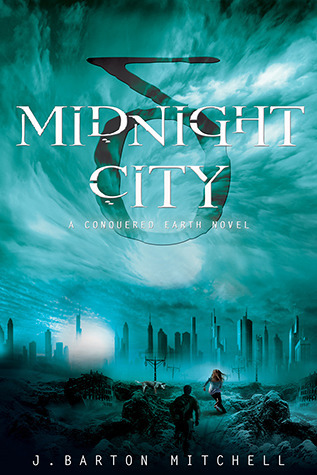 Earlier this month, I reviewed the first book of the series, Midnight City. The second installment didn’t let me down. The book picks up with Holt, Mira, Zoey and Max journeying to the the Severed Tower in the center of the Strange Lands so that Zoey can fulfill the prophecy revealed to her by the Oracle. They know that reaching the tower will be difficult, but it proves to be more than they expected. To begin with, the Strange Lands, a dangerous region where the laws of physics don’t always apply, seems to be expanding. Then, the Assembly aliens, who usually avoid the Strange Lands, continue their pursuit of Zoey. At the same time, the pirate group that has a bounty on Holt arrives on the scene. And as the team gets closer to the tower, Zoey grows progressively weaker. Fortunately they’ll find unexpected help along the way: Mira’s old Freebooter associates, the White Helix (a cult that reveres the Strange Lands), a reluctant Menagerie team, and even a mysterious Assembly walker who has been stripped of its colors. Will it be enough? Holt and Mira don’t know, but they’re willing to sacrifice everything to ensure that Zoey reaches the Severed Tower–not just to fulfill their promise to her, but because they’re starting to believe that she just might be the key to overthrowing the Assembly once and for all. As before, Mitchell has crafted an action-packed novel that keeps you on your toes from beginning to end. Since that was one of the things I loved about Midnight City, I was pleased to see that the pacing didn’t suffer from the sequel slump. Instead, he presented even more sources of danger to keep readers on the edge of their seat. I especially loved the introduction of the Anomalies in the Strange Lands, which were presented as puzzles that could kill. They definitely added a new level of suspense, especially since their appearance was unpredictable. I also liked how Holt and Mira were forced to confront their pasts–and how it brought old weaknesses and self-doubt to the surface. They could easily have ridden high on the confidence of their victory at Midnight City. Instead, we were given more opportunity to see complex emotions and character development. By introducing people from their pasts, Mitchell also provided the audience a window onto why they behave as they do. And I especially liked the parallel development, that Holt and Mira are both confronting their issues at the same time. Most of all, I enjoyed getting some more points of view in the narration. The first book was mostly from the perspective of Holt and Mira. Technically, this one might have been, too. However, this time we got much more from Zoey, as well as sections told from the perspective of the Assembly Hunter, Avril (from the White Helix), and an Assembly walker called “Ambassador”. This inclusion of more perspectives helped to flesh out Mitchell’s Conquered Earth world even more. There were a couple of minor issues with the book. First, there were some flashback chapters that I found a bit jarring. The first time that I encountered one, I wasn’t sure what was going on–if it was the result of a Strange Lands anomaly or what. They could have been set up a little more effectively, so that readers didn’t have to expend so much energy trying to figure it out (since there are so many more interesting things to speculate about). Second, I was a little unsure about how well the book stands alone. As someone who enthusiastically read and enjoyed the first novel in the series, I was able to follow along with no problem. Names, place, and terms specific to the series were already familiar. I do think that people who haven’t read the first book will be able to read and enjoy this one; I just wonder if it might be a bit confusing at times. It’s always a challenging situation, though. Too much rehashing alienates established fans, too little alienates new readers. Overall, I loved it. I’m a fan of the blending of dystopia, sci-fi and fantasy elements. I like the themes of alien invasion, survival, friendship, social organization, and morality. It’s not only one of the most unique stories I’ve read, it’s also one of the most exciting. The Severed Tower earns 4 stars and my enthusiastic encouragement that you get out there and read it, so I have someone with whom to discuss it! You can find more information about this book, including other reviews, at Goodreads. And, if you have a US or Canadian shipping address, you can enter to win a copy of your very own! 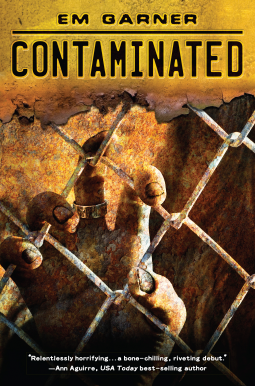 Today’s book review is for Contaminated by Em Garner, published by Egmont USA. I received an electronic copy of this text from the publisher, through NetGalley, in exchange for an honest review. Contaminated is a novel for young adults and teens, set in a dystopian near-future. When a trendy diet drink started to turn people into shambling, murderous creatures unable to control their impulses, society starts to crumble. Luckily the government is able to step in to round up those who have been contaminated and neutralize the problem–the first step to getting back on track. Since the contamination, 17-year old Velvet Ellis has been juggling school, work, and parenting her little sister, Opal. Then, after months of searching, Velvet finally finds her mother at one of the “kennels” for the contaminated, and her life is turned upside down again. She’s told that her mom will never recover from what happened, but it’s not long before Velvet starts to question that assertion. Is it just foolish hope, or can the contaminated improve? And will she be able to hold her family together when the world seems to be doing everything in its power to tear them apart once more? I have to say, Garner has come up with an incredibly compelling plot. As soon as I read the book synopsis I was eager to request a review copy. Not only was it an interesting twist on the zombie trope, it also pulled in the moral questions of dystopia. Heck, there was even a little jab at diet culture and consumerism. What’s not to love? Unfortunately, quite a lot. First, the pace was ploddingly slow. From the description, it sounds like the sort of book that would have a lot of action and intrigue–but it doesn’t. Very little actually happens. I was halfway through the book when I had the realization that nothing really significant had happened. Then, I realized that all of the cool-sounding plot stuff wasn’t the primary story. The primary story was the story of an adolescent, Velvet, having to grow up before she was ready–learning how to navigate the world of adulthood. She spends most of her time worrying about laundry, the food budget, keeping her sister in school, how to support her family, all while caring for a mother who has essentially the same problems as a patient recovering from a major stroke. It wasn’t a bad story–it just wasn’t the one that was advertised. Then there was the problem of Velvet. The entire story is told in first person from her point of view. The problem with this is that Velvet isn’t all that interesting or likable as far as narrators go. She’s too flat, too catty, too irritating. Fortunately I liked Opal and I was interested to discover what would happen with their mother. Otherwise, I’m not sure I could have tolerated the narrative voice. Velvet’s inner monologue is incredibly redundant and exceedingly boring. That’s because, as mentioned earlier, she spends a lot of time thinking about mundane things. She’s also so judgmental and catty that when other characters are hostile toward her it’s hard to feel much sympathy. I think it’s supposed to be an indication that she’s hardened by the trauma of her experiences, but it read as mere pettiness. Here’s the thing, though. In the last hundred pages or so, stuff started to get interesting. New cases of contamination started to appear. The media started to shut down. Soldiers and police started asserting more control. And even though Velvet was still focused on her family, it raised a lot of questions for the reader. Then, it ended before any of those questions were answered. So, even though there were some problems with this book, I’m hoping that there will be a sequel. I don’t really care about what happens to Velvet, but I do want to know more about the world she’s living in. Which means I’m giving Contaminated 3 out of 5 star rating. Because, for all that I didn’t like about it, I still liked it enough to want to read more. Today’s book review is for Midnight City, the first book in the Conquered Earth series by J. Barton Mitchell, published by St. Martin’s Press. I received a free copy of this book from the publisher, through the Goodreads First Reads program, in exchange for an honest review. The second book in the series, The Severed Tower, is scheduled to be released later this month. Midnight City is a science-fantasy novel set in a dystopian future where aliens have conquered earth. When the aliens invaded, they were able to subdue the human population through the use of a strong telepathic signal called the Tone. However, the signal only works on people once they’ve reached adulthood. The result is that children have organized themselves into a new society, doing what they can to survive until they finally succumb to the Tone. The story follows Holt Hawkins, a loner bounty hunter, whose only companion is his dog Max. But when Holt and his target, wanted treasure hunter Mira Toombs, discover a young girl in a crashed Assembly ship, his life is turned upside down. As the three companions make their way to Midnight City, they must evade feuding alien armies, deal with pirates, and escape mutants. Meanwhile the mysterious young girl, Zoey, starts to display amazing powers that just might be the key to defeating the Assembly once and for all. Holt must decide: is he going to continue to go it alone–or will he work with his newfound companions for something greater than mere survival? Mitchell’s debut novel starts in the middle of action and never relents. It is a fast-paced and gripping story that I didn’t want to put down. The plot and pacing were both masterfully executed. And, yet, for as much action as there is, there are some wonderfully executed characters. Not only do they feel dynamic and real, but they also grow over the course of the story. It’s nice to see that sort of development in a work that is so heavy on plot and action. I was especially drawn in by Mitchell’s world building. I loved the empty landscapes, the crumbling remnants of civilization, and the strange new settlements built by the surviving children. I liked the descriptions of the Assembly, cloaked in spindly-legged walkers, true forms always obscured. Even the descriptions of the Strange Lands, which are never visited in the course of this novel, still pop with life and energy. This world is broad and complete–especially the descriptions of the expansive cave metropolis known as Midnight City. 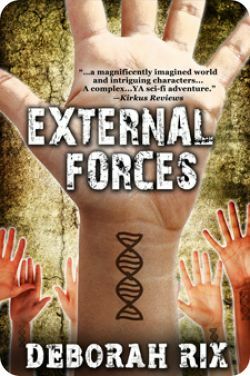 This is a compelling young adult read with elements of dystopia, science fiction, and fantasy. It explores themes of alien invasion, survival, friendship, social organization, and morality, among others. Although the descriptions of the aliens were reminiscent of War of the Worlds, the overall story is refreshingly original. I give it 4 out of 5 stars for being such a strong and engaging novel. I can’t wait to read the sequel.